The players put together four shows in any order: Queenie, Wolf, King Lear, and Ballet. To accomplish this, players draft actor cards from a constantly changing queue of cards. Each card represents actors of varying skills at roles. Once a player puts together all the needed roles for a show, the value is judged against all the other productions of that type, with points given relative to the other productions. 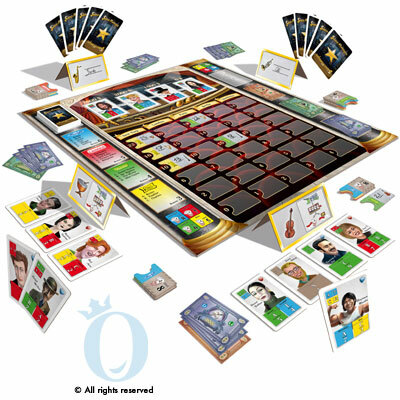 This is a Queen Games reprint of the db-Spiele original, Premiere. In Show Manager, the players act as theatre producers, hiring various actors to stage 4 musicals-Moonlight, Lipstick, Queenie, and Rats. (I believe I have an “American” version of the game) I found this game, one of the few out there with a theatre theme. The basic game play is card drafting and resource management. You don’t have to be a theatre patron to enjoy, but the more my gaming group gets into introducing the casts the more fun it can be to play. Be careful with replacing all the actors on stage too many times, as other players see their perfect casts get swept off stage to be replaced with inferior actors, you can become that hated show manager. I think this is good for family’s, social gamers, casual gamers and avid gamers. 6)Set the production value for any unclaimed “touring theatre” productions, these will go on board once a production with that name is staged by an active player. Hiring actors is simply, pay the cost to the bank and add the actor to your show (hand). All remaining actors on stage, stay on stage, and cards shift right to fill in gaps and a new actor is placed on the $3000 space. You produce one show at a time, but be careful, many actors cost money and are only talented enough for certain roles, the actors cards have values that let you know how well each actor fits to the roles they can play. As a producer you have only so much money, this is live theatre after all, to get all four musicals staged. Each show has a certain number of actors. The show you are producing will dictate your current hand size, when your show is “staged” you can only have 2 more cards left in your hand. You must have the minimum number of cards, dictated by the shows cast size. If you reach your hand limit, you must stage your musical on your next turn. To stage a musical, you introduce the cast to the other players, placing the card on the table for all to see. Count up your points, an actor can only score points if they take on a role named on their card. If the actor is cast in a role they can’t play, they give no points. Amateur actors, can score 1 point for any role, they are never mis-cast. If you cast the first version of a show, you get to choose the city all musicals of that name will be staged. Each city has 6 slots, and depending which city will let you know how may victory points you get: New York ranges from 22 to 0, while Stockholm ranges from 14 to 4. So placement will be key depending how confident you are in your production. If production values tie, first player on board gets the higher slot. After all musicals have been staged by all players, you count up victory points and declare a winner, remaining cash breaks any ties. 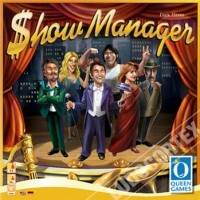 Add a Review for "Show Manager"